French theatre icon, Maud Andrieux performed a solo act based on Marguerite Duras’s ‘L’Amant’ in Kolkata, concluding her tour across India. 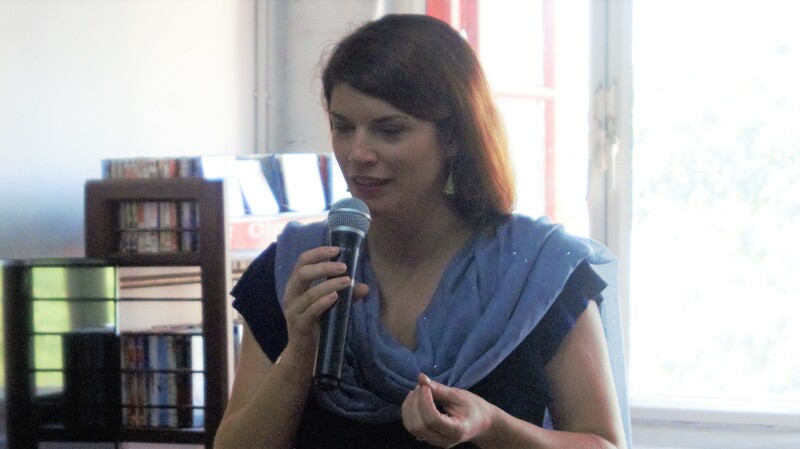 Maud Andrieux, the French theatre sensation and television actor known for her range of works which include, Chair eternelle and Famille d’accueil among the many others that she had either put up on stage or screen, concluded her tour of India with a last show of her critically acclaimed, L’Amant in Kolkata on November 5. The Alliance Francaise organisation has been hosting her in other Indian cities like Chennai and Hyderabad with the Kolkata performance being hosted by the Alliance Francaise du Bengale. L’Amant, the play that Andrieux had performed, is her self-penned adaptation of Marguerite Duras’s novel of the same name. Andrieux has been closely following Duras’s works for a long time. Since 2004, she has adapted and interpreted several of Duras’s works. The Sea Wall and The Vice-Consul have both been adapted by the theatre practitioner into affluent plays. Talking to Media India Group during the “Meet the Artist” event before the show Andrieux talked about her love affair with theatre as well as, the process of adapting the 350-page novel into a one-and-a-half-hour solo performance. How did you begin your theatrical journey? I was a very shy and timid child. When I was seven, my mother, in order to get me out of that phase, put me into theatre. She thought that the theatre would prove to be a good place for me to drop my inhibitions. And happily, it worked! I cannot thank my mother enough to show me the way! I went to study theatre in Bordeaux Montaigne and there I realised that I can be my other self while I am up on stage. Maybe, theatre was just my destiny! What sparked your love for Duras’s works? Marguerite Duras was a French novelist, playwright, screenwriter, essayist and experimental film maker. She was a multi-dimensional figure and the best thing about her is that her writing and her vocabulary are very easily comprehended. Her prose is so descriptive, you can literally visualise everything that’s written. It all started when I read, Un barrage contre le Pacifique (The Sea Wall) and it was like a proverbial slap to the face of French colonial history! L’Amant too is an autobiographical tale of injustice and hope in the French Indochina of old. It is a story very close to my heart. How does a solo act adapt a narrative of multiple characters? If you’re concerned about how the act would look on stage… Don’t be! You see, it’s not just a simple reading. I wouldn’t be portraying the teenage protagonist, of course. I would be portraying her in her older days and a major chunk of the story would be told in flashbacks. A major part of the narrative is in its eroticism and portraying that in a solo act is perhaps the biggest challenge. The lighting and the effects have a lot to play and the music composed by the talented Marco Gomes is the soul of the act. Marco understands the spirit of the narrative and that lends on to his composition. If it were not for theatre, where do you think you would be? Well, if not for theatre, then… Well, I have never been as attracted to the screen as much as I am to the stage, so, I don’t really think that would have been my avenue, either. I don’t know, to be very honest. The theatre and my two kids are my life and I wouldn’t have it any other way. L’Amant was staged at the Park Mansion, Kolkata, in the evening of November 5 to a very select audience and was turned out to be a success, even overcoming the constraints of the language barrier between Andrieux and the audience.